Published: Dec. 9, 2012 at 04:54 p.m. Updated: Dec. 10, 2012 at 09:28 a.m. The Atlanta Falcons played some of their worst football of the season in Sunday's 30-20 loss to the Carolina Panthers -- at least early on. That had everything to do with Panthers quarterback Cam Newton. Check out the best photos from the Week 14 matchup between the Falcons and Panthers. Carolina's second-year starter silenced Atlanta by sustaining drives and keeping Matt Ryan and the Falcons' typically well-prepared defense on its toes. The Panthers built a 16-0 halftime lead by holding the ball for 21:35 minutes during the first two quarters. Ryan threw for just 40 yards in the first half. He turned it on in the second, finishing with 342 yards total, but this game belonged to Newton. It was his finest performance of the season -- and perhaps of his young career. 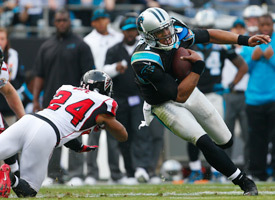 Newton's 287 yards off 23 completions included better decision-making and a string of key third-down conversions. Everyone will talk about Newton's 72-yard, highlight-reel touchdown scamper in the third quarter, but his growth was evident in how he kept drives alive with his arm. Many of Carolina's scoring drives were long, clock-chewing epics. Tight end Greg Olsen's 25-yard, first-quarter touchdown grab from Newton capped an 11-play, 77-yard drive that took up seven-plus minutes. A Graham Gano field goal capped another 17-play, 72-yard march that swallowed more than nine minutes off the clock. By the time Ryan and the Falcons' offense woke to life, it was too late for them to avoid their second loss of the season.